Update: As of June 2015, Second State is closed. When I first moved to Washington, D.C. in 1999, Dupont Circle was one of the city's hottest neighborhoods. There were few weekend nights I didn't blow my hard-earned intern salary in its many restaurants and bars. Fast-forward 15 years and the buzz of Dupont Circle's dining scene is like chirping crickets. In an era where hot restaurants open weekly, the focus is on Shaw, H Street, Bloomingdale, the Waterfront, etc. The only notable opening in Dupont Circle in years was Little Serow (and it wouldn't surprise me if some try to call that "Logan Circle West," the way people used to talk about Logan Circle as "Dupont Circle East"). So I was intrigued to see that Thrillist named Dupont Circle establishment Second State one of its 11 best new restaurants in D.C. for 2014, a list that includes hits like The Partisan, DBGB and Sona Creamery (update: Sona Creamery is also closed). Second State's name is a reference to Pennsylvania, the second state to ratify the U.S. Constitution (after Delaware). The commonwealth provides inspiration for the restaurant's menu, although it is not a slave to it. There are more Virginia than Pennsylvania farms represented in the menu's list of ingredient sources, for example, but quite a few Pennsylvania-sourced beers and spirits on its bar menu. The restaurant is certainly handsome. I love the whitewashed exposed rafters and brick. Second State quickly made a name for itself just before its fall opening as word spread it would be charging extra for "artisanal ice" in its cocktails--the sort of super clear ice that's supposed to make cocktails taste better (I'm not buying it, frankly). It's a shame the buzz wasn't for its food, which I had high-hopes for, given that its menu consists of the kind of soulful comfort food I love. However, we found it to be disappointingly hit-and-miss. Shortly after being seated, our server brought us a bucket of spiced popcorn, a great idea for a gratis table snack. We worked our way through two helpings and would have dug into a third if we hadn't willed ourselves to leave room for our ample orders. For starters, we ordered a bread basket and a grilled romaine Caesar salad. The bread was really good. 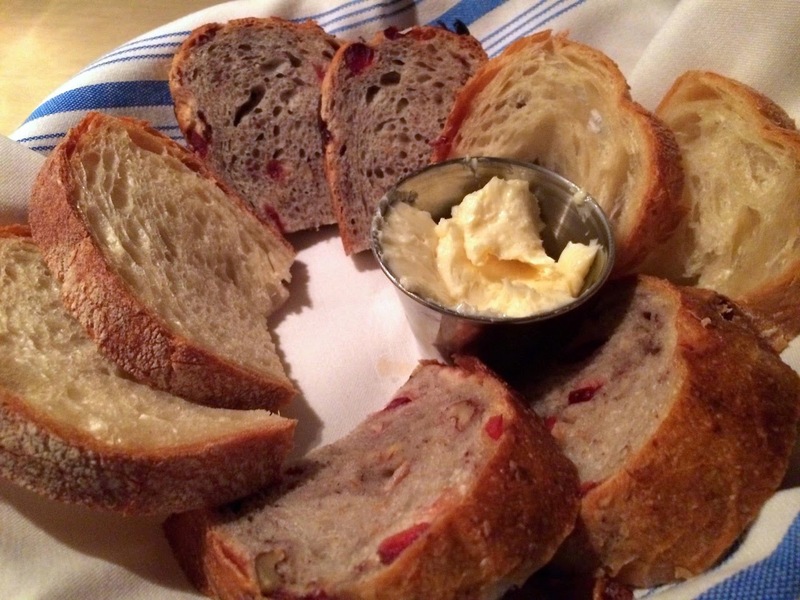 I loved both the chewy white bread and the grain bread flecked with dried cranberries and nuts. How was the Caesar salad? Unfortunately, I cannot say, as the kitchen never sent it out. A shame, since I love the idea of a grilled Caesar. Our server apologized and said the kitchen was still working out some kinks. Apparently so. I was excited to see that Second State has a ribeye steak on its menu. Ribeye is my favorite cut; so many restaurants are serving hanger steak these days, which I don't like as much. Chris likes ribeye too, so we both ordered it. 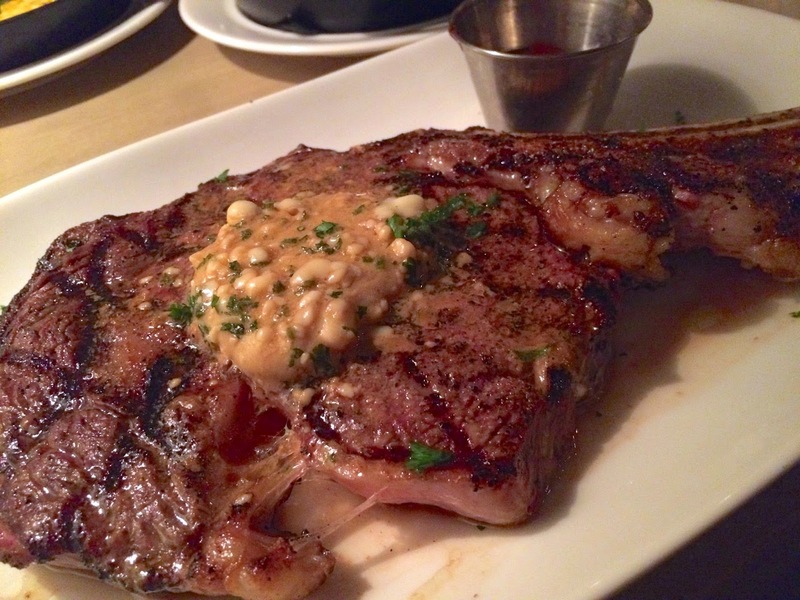 My ribeye was spot on: juicy, flavorful and perfectly medium-rare as I'd ordered it. Chris's steak, however, was not as good, as his poorly chosen cut had too much fat, providing him very little actual meat. Our sides were good though. 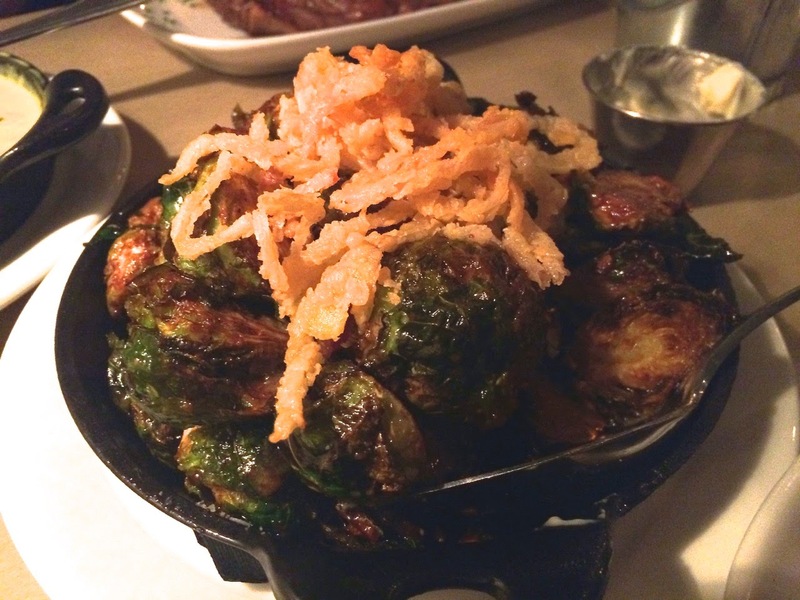 We opted for the fire-roasted creamed corn and fried Brussels sprouts with shallots, bacon, maple and mustard. Brussels sprouts are everywhere these days, but they aren't always cooked to my liking. Second State's were tender-chewy and browned around the edges the way I like. 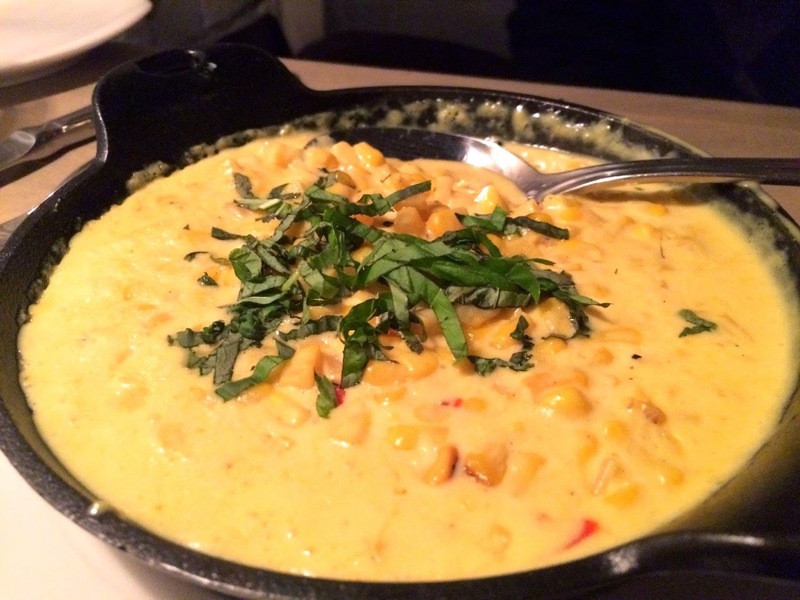 And the creamed corn, while simple, was creamy and satisfying. 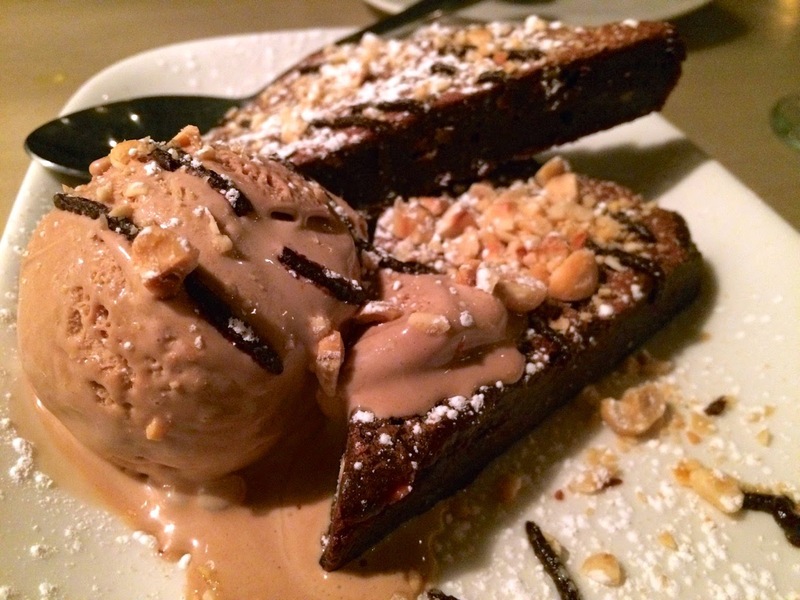 Dessert was also a winner: a dense stout brownie served with Nutella ice cream and garnished with a sprinkle of hazelnuts and chocolate sauce. It's the perfect size for sharing. About that artisanal ice...we didn't get any. Not that I expected to (we didn't order the right drinks), but we did sample the cocktail menu. Chris ordered a whiskey sour made with a Pennsylvania rye whiskey, amaretto, apple cider reduction, lemon, egg white and Peychaud's bitters--an excessive list of ingredients for the usually simple whiskey sour. I think they tipped the scale too far into sour, as the drink could have been better balanced with a little more sweetness. I was more impressed with the Liberty Punch, made with gin, lemon, ginger, sweet tea, agave and lavender bitters. This drink was nicely balanced. My only gripe was that, as a crushed ice drink, I wished it would've been served with a straw. Second State has the appearance of a restaurant that would like to be known for its cocktails. Based on our experience, they need more attention to detail. Launching a new restaurant is not easy. Having read Mindy Wizenberg's great memoir, Delancey, about her and her husband opening their pizza restaurant, I know that so much sweat and tears goes into it. But when those doors start admitting guests, you gotta get it right. While we enjoyed a lot of what we experienced at Second State, there was too much that felt like a first draft. 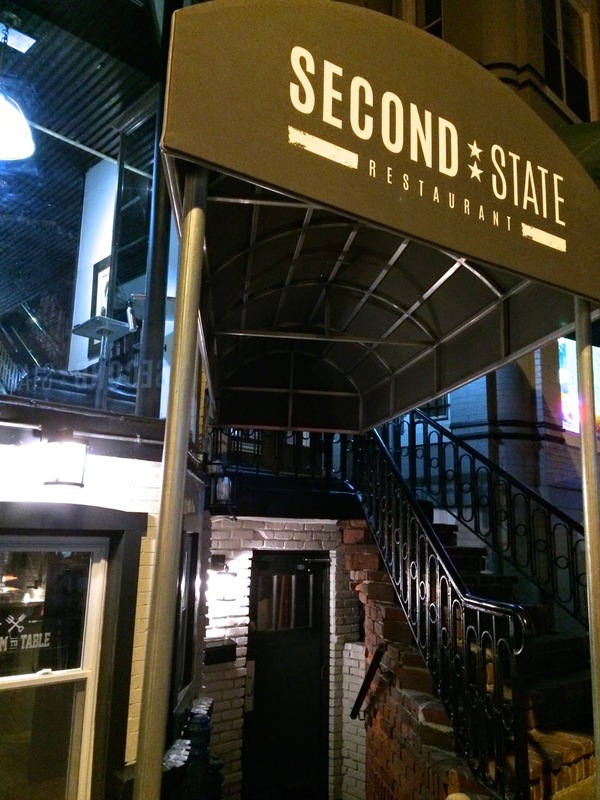 Second State, 1831 M Street NW (between 18th and 19th), Washington, D.C. (Dupont Circle). (202) 466-3010. Reservations: Open Table.